Hope you have all had a lovely weekend. Thank you once again for all linking up again, some fab reads as always! I have had an awful weekend, with my son being taken into hospital by ambulance at 0500 on Saturday morning. Thank God that he is now well on the meant after having us all worried and very sleep deprived over the weekend. We all love to save money and this week I really loved reading about money saving tips from, Because I’m Cheap blog. Any money saving ideas are fantastic and everyone would always be up for saving money I am sure. I am always looking at ways to save money any where I can. 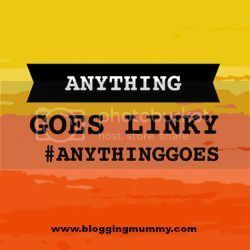 If you tweet using the hashtag#anythinggoes and add me @bloggingmummy87 into the tweet I shall retweet all links. Hi Rachel! Thank you so much for hosting this link up! Very glad your son is ok, that is so scary when our littles are sick! Cheers!